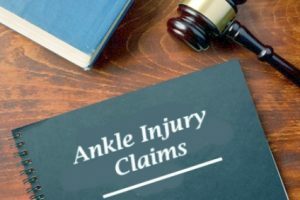 Ankle Injury Claims Guide – How Much Compensation Can I Claim For A Ankle Personal Injury? – How To Claim? The ankle is a complicated joint. It is crucial in supporting the leg, helping us to walk and run. We tend to think that an ankle injury is something that affects sports people, and they are often associated with exercise. If you have had an ankle injury, such as a fractured ankle, sprained ankle, or have twisted your ankle and are reading this guide you will know that ankle injuries do not have to be either related to or caused by exercise. Walking on uneven ground or a simple fall could cause you to suffer serious soft tissue injuries, such as damage to the ligaments supporting the joint. In this guide, we will look in detail at the circumstances in which you could suffer an ankle injury, as well as looking at some of the most common types of ankle injury suffered in the UK. We will then advise you on the best way to make a personal injury claim for compensation and answer common questions such as “how much can I claim for an ankle injury?”. We have also included our contact details at the bottom of this guide. Ankle Injury Compensation Calculator – How Much Can You Claim? What Is An Ankle Injury? Time Limits – How Long Do I Have To Claim Compensation? The ankle in an important joint and even a simple ankle injury, such as a twisted ankle, can have a big impact on you. As the ankle joint bears the bulk of our weight, it is hardly a surprise that ankle injuries are quite common. In the majority of instances, they will have been caused by everyday activities. You could have simply been walking down the street and tripped over a paving slab. Whilst we can all be a bit clumsy sometimes and cause ourselves an accident, your ankle injury could also be the result of another person’s negligence or error. If your ankle injury was caused by another party, we could be able to help you claim compensation. Some headline statistics surrounding ankle injuries show their prevalence. According to the British Medical Journal, 14% of people attending an A&E with a sprained ankle were classed as a severe ankle injury. This equates to 42,000 with a severely sprained ankle. To find out the answer to questions such as “can I sue for a sprained ankle?” please read the rest of our guide below. If you have found this advice guide you may have already searched for a personal injury claims calculator to check how much your injury is worth. Whilst such tools may be good for illustrative purposes, they can not tell you the exact amount that you could be awarded. Put simply, there is not accurate average ankle injury claim which we can quote to you. This is why we have not included an ankle injury compensation calculator in our guide. Instead in the table below we have included details of compensation bands for different levels of ankle injury. These figures are taken from the 2018 updated guidelines from the Judicial College. These recommendations are followed by personal injury solicitors and the courts’ system. Very severe £43,900 to £61,110 Injuries falling into this bracket are ‘limited’ and ‘unusual’. Examples include a bilateral fracture causing degeneration in the joint. Severe £27,450 to £43,900 Injuries which require an extensive rehabilitation period. Moderate Up to £12,050 Less serious fractures, sprains and ligaments. Modest £4,820 Injuries will be resolved in a short amount of time. Remember, we recommend not using online ankle injury compensation calculators other than this table as they may provide you with a false expectation of the value of your injury. When looking at answering a question such as “how much compensation will I get for a broken ankle?” we need to look at the way compensation settlements are put together and what can be included in them. How much you will get for an injury such as a broken ankle will be calculated by combining settlements for general damages, the injury itself and special damages, other financial costs incurred because of the accident or injury. We have looked at general damages in the above section and provided up to date examples of compensation settlements. As stated, special damages are designed to compensate you for the financial effect of your accident and the injuries suffered. You may find that whilst care is available via the NHS, better care is available in the private sector. You may also need to make contributions towards prescription medication. Travel expenses which are incurred because of your accident, such as travelling to the hospital, doctors or other medical facilities can also be recovered. Depending on the severity of your injury, you may find that you needed to take time off to recover. You could lose both income and workplace benefits, such as pension contributions. Your personal injury claim can compensate you for these losses. For an accurate assessment of how much your ankle injury settlement amount could be worth, talk to a personal injury solicitor. Your ankle is one of the more complex joints in the body. It has to move through a variety of different plains of motion, rotate and support the body. The joint is made up of several bones, tendons, and ligaments. With a variety of tissue types and functions, the joint is susceptible to a variety of injuries. These include a fractured ankle, twisted ankle, sprains & strains, as well as dislocations. An injury to any part of the ankle can be very painful and due to the joints function, they can place a severe restriction on your ability to walk and move about. Even minor injuries can result in you needing to take time off and rest the joint. The talus (foot bone above the heel). Each of the bumps of bone in your ankle also have specific names. The bump on the inside of your ankle is called the base of the tibia and is called the medial malleolus. You can feel a bump on the back of your ankle is again part of the base of the tibia. It is called the posterior malleolus. At the low end of the fibula, on the outer side of the ankle, you can find the lateral malleolus. The purpose of the ankle is to allow your foot to move up and down. Below the ankle joint is the subtalar joint. This is the joint allowing side-to-side movement. Surrounding these two joints are ligaments which bind the bones to each other and to the foot. Lacerations, cuts and severe bruises. The most common type of injury are ankle sprains and strains. Whilst these can be a relatively simple injury, they can still take between two and six weeks to recover from. In the meantime, you may not be able to properly walk or be able to work. Those injuries which are the most painful may also not be those which take longest to heal. A dislocated ankle is more painful than a ligament injury. But the ligament may take longer to heal. There will be a significant variation in how severe ankle injuries are and their effects on you. However, even if you have a simpler injury, as long as you can show that someone else was responsible for your accident, you could be able to claim for an ankle injury. As we have seen, there are several bones in the ankle and the subtalar joint which could be broken or fractured. You can find out more about fractures and breaks, such as a broken ankle, here. The most severe forms of a fractured ankle might require surgery to correct. In some cases, the break or fracture may also damage the supporting ligaments and surrounding tissues. These type of injury will take a little longer to heal and will restrict your mobility whilst you recover. To find out whether you can claim compensation for talus fracture and how much you can claim for a fractured ankle, talk to our experts today. There are two main types of ankle sprain which you can claim for. These are an inversion ankle sprain and an eversion ankle sprain. You could make a personal injury claim for either type of sprained ankle. These happen when you roll your ankle inwards or when you twist your ankle in an inverted way. This stretches and damages the lateral ligaments. It a very common type of sprain and in the majority of cases is quite mild. In these cases, the sprain is caused by your foot turning inwards, rather than outwards. Again, this will affect the ligaments in the ankle. It is less common and can be more serious than the previous category. If you have twisted, sprained or strained your ankle, you could make an ankle ligament injury claim. How your ankle injury will be treated and the length of time it will take to heal will depend on the type of injury suffered and its severity. Broadly, the treatment of an ankle injury can be broken into three types. These three are treatments for an ankle fracture, treatment of sprains and treatment of tendon injuries. Depending on how serious these are there may be cases where invasive or surgical treatment is necessary to correct any damage. In other cases, they can be treated with a combination of rest and recovery. To make a claim for an ankle injury, please contact our advisors today to find out more. Slips and falls on the street, or whilst walking on private property. Slips and falls caused by wet or damaged floors. Car crashes or other road traffic accidents. Remember, whilst you are often owed a duty of care by drivers of vehicles, public bodies responsible for maintaining the pavement or a shop, you must also exercise your own common sense. If you make a personal injury claim for a sprained ankle or other forms of injury, the courts will determine the degree of negligence the party you are bringing a claim against had. On average, ankle injury claims will very often involve a slip, trip or a fall. These can happen anywhere from the street to a public park, when crossing the road, in a shop or restaurant or whilst at work. No matter when you slipped or fell over, if another part was responsible for the accident, such as a local authority failing to repair and maintain pavements, you could claim for an ankle injury settlement. If you suffered a sprain or strain because of a slip or fall accident in a public park, on the street, or when crossing the road, you could make a sprained ankle injury claim against the council. However, if you suffered a broken or fractured ankle due to a fall in a shopping center, supermarket, or restaurant because they had not observed their duty of care as an occupier, you could make a personal injury claim for your broken ankle against them. If you are unsure of who was responsible for your accident or whether you have grounds to claim, talk to a personal injury lawyer today to check your eligibility to make a claim. Whilst you are at work your employer has a duty of care to ensure that you are kept safe and free from harm. This responsibility is the same whether you are in your usual place of work, or somewhere you are sent. There are numerous different ways in which you could sustain an ankle injury at work, but the most common of these are slips and falls. Having an ankle injury in the workplace could lead to you being immobile for an extended period of time and either reduce your ability to work, or prevent you from doing so. 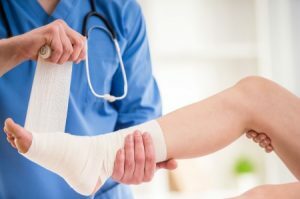 If you make a fractured, twisted or sprained ankle injury claim against your employer, you can include any earnings already lost and future earnings. Find out more about claims against your employer by discussing your case with a personal injury lawyer. Ankle injuries sustained in a road traffic accident tend to be more serious, such as breaks and fractures to the bones of the ankle. Your road traffic accident could have happened whilst you were a driver, passenger, or even as a pedestrian. It could also have involved any vehicle, such as a car, lorry, bicycle or motorbike. You could also have sustained your accident whilst on public transport. As long as you can show that another road user or person was responsible for the accident happening, you could claim compensation. Most vehicles do not have any specific safety features to protect your lower legs, so they have a higher chance of being injured. If you have sustained an ankle injury in a road traffic accident, find out how much for a fractured ankle you could claim by contacting a specialist solicitor. No matter the reason you are making a compensation claim for, you need to make sure that you do so within the appropriate personal injury claims time limit. Currently, this time limit is three years, with the starting point either being taken from the date of the accident, or the date from which your injury was diagnosed and connected to the accident. We have included relevant time limits in this handy table below. Injuries falling into this bracket are ‘limited’ and ‘unusual’. Examples include a bilateral fracture causing degeneration in the joint. Ankle injuries to a child Responsible adult can make the claim on behalf of the child till they are, or 3 years from their 18th birthday. Injuries which require an extensive rehabilitation period. General injury claim limits 3 years Less serious fractures, sprains and ligaments. Ankle injuries on a flight 2 years Injuries will be resolved in a short amount of time. When you are injured the first thing that you should do is to get any medical help and treatment you need. Your health should always be your primary concern. To be able to sue for your sprained ankle or other types of injury there are several steps you should take. Make sure that you report the injury to any relevant parties such as a shop, the local council, driver of a vehicle, etc. Make sure that the injury is recorded in any appropriate accident report books. Combined with the immediate medical report, this begins creating a trail of evidence your solicitor can use in your claim. Next, we recommend that you do sit down and make a note of your injuries. If you can, accompany this with any photographs of the injury and the area the accident happened in. Also, make a record of any witnesses who could provide evidence. These immediate steps will help your solicitor or lawyer to build a stronger case for your claim. We would next recommend contacting a personal injury lawyer or solicitor and obtaining legal advice. These specialists can provide advice as to the validity of your claim and whether or not you are likely to be successful. If the solicitor takes on your case they will conduct steps such as forwarding evidence of your accident and injuries to the defendant and details of how your case will be pursued. In straightforward cases, it is likely that there will be an out of court settlement. In the majority of cases, the ankle injury claim will be settled out of court. Across the country, many ankle injury claims are made through no win no fee agreements. These agreements are beneficial for the claimant and solicitor. Such agreements ensure that only claims which are valid are pursued. For the claimant, there are no initial fees to pay and under any eventuality, there are no financial losses. To learn more about making a no win no fee twisted, sprained or fractured ankle compensation claim, speak to an expert advisor today. We like to think that our advisors have the knowledge and expertise to help you. They will take the time to listen to you with a friendly and sympathetic approach. If you wish to make a claim with our team, you can take these three simple steps. Collect together details of your claim and call our team. We will then assess whether you have a valid claim. We will provide you with a solicitor for your claim. Get in touch with our expert advisors today. You can contact us by calling on 0161 696 9685, or you can use our online contact form by clicking ‘contact us’ at the top of this page. In this guide from the NHS, you can find information on fractures and breaks to the ankle. In this NHS guide, you can find information about treating sprains and strains. We do recommend that you seek medical treatment from a doctor even for a minor injury if you wish to make a claim later.